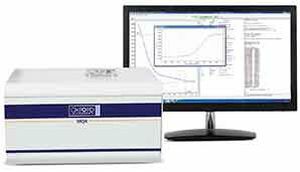 The MQR is a low resolution, high performance TD-NMR research system designed for applications based on relaxation and/or diffusion measurements. The system includes a high performance digital spectrometer, 21MHz (0.49T) permanent magnet, and a choice of interchangeable 10, 18 and 26mm probes. The MQR is supplied with the Application Developer software package – a fully integrated development environment that allows users to write pulse sequences, set parameters, run and debug sequences, and visualize the results. Shaped RF and shaped gradient pulses can be included, and calculations can be embedded in the pulse sequences. An editable library of common pulse sequences is provided, as well as a basic data analysis software package that includes simple curve fitting and 1D Inverse Laplace transforms.